In reading the Atlas of Cosmetic Surgery entitled "Mastoplastiche Estetiche" by Giovanni Botti, one has the sensation of conversing with the Author (for all those who have had the chance of meeting him), because the book presents a honest, clear, direct, familiar and incisive exposition in up-to-date terms, as well as being scientifically correct and exemplary. No bombastic and refined medical jargon, just essential and precise discourse that goes straight to the point. Botti has done very well in publishing this "Atlas". He has filled a gap in Italian literature on the topic. Texts on breast surgery in Italian are not lacking but, to my knowledge, an atlas dedicated exclusively to cosmetic breast surgery written in our language with such an exquisitely practical, clear, complete and effectively didactic "style" had certainly not existed until now. I am sorry that such a publication was not available when I was starting to get familiar with breast surgery. The Author guides the reader through the various chapters explaining with confident simplicity the different problems, difficulties and ways to overcome them as well as the many surgical techniques, not only the ones considered "trendy" but also those that are sometimes wrongly thought to be a little obsolete, providing the most appropriate information for each one. It is like having access to a learned "user's manual". "And now let's choose our case": is the colloquial title that Botti applies to an abundant gallery of cases represented in pictorial form with a perfectly written commentary which contains the types of mammary dysmorphism that, from time to time, might interest everyone. This aspect of the atlas is reassuring for readers who are not skilled yet while those who already have a background in the field will derive support and advice from it. In the following chapters, all types of dysmorphism are discussed with the above mentioned simplicity. The expositive completeness arises from the Author's vast clinical experience, his acknowledged competence and his technical excellence. Furthermore, explanatory and sophisticated photographic documentation of operating sequences has been included. 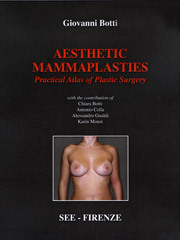 All those who are scientifically interested and wish to get familiar with the various problems of cosmetic breast surgery will find in this atlas a compendium of all those situations which most frequently occur in every-day clinical experience, advice for their management and up-to-date information on current practice.